The mediterranean tree frog is one of the species whose tadpoles go for more plant foods in hot weather. Climate change is one of the most serious threats for biodiversity. Climate change is characterized not only by the rise in average temperature (global warming), but also by the increased severity of extreme weather events (e.g. droughts, hurricanes, floods or heat waves). These extreme events impose serious and immediate challenges, and to cope with them organisms living in natural environments need to modify their behavior, physiology or life-history. Among the groups potentially affected, amphibians (frogs, toads and salamanders) with many species and populations rapidly disappearing worldwide are one of the most endangered, and have become the focus of significant research and conservation efforts. 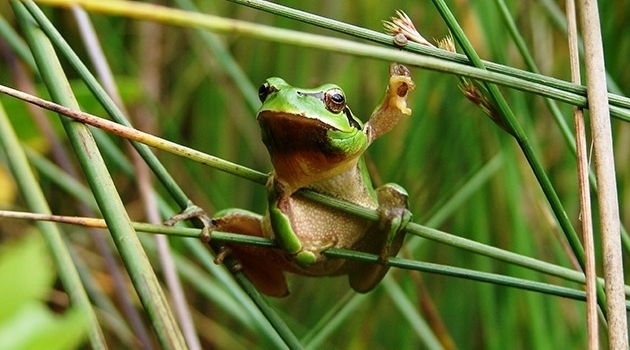 In the new study, the researchers investigated how heat waves affected diet choice of the tadpoles of three amphibian species occurring in Portugal: the Iberian painted frog (Discoglosus galganoi), the European tree frog (Hyla arborea) and the Mediterranean tree frog (Hyla meridionalis). In laboratory experiments, they reared tadpoles of these species on animal, plant or mixed diets and exposed them to simulated heat waves differing in timing and duration. By comparing the Carbon and Nitrogen isotope ratios of the tadpoles with the isotope ratios of the animal and plant diets, the researchers were able to reconstruct the dietary choices of tadpoles fed on the mixed diet and assess their feeding preferences. The results show that the basic diet choice for each species depends on the normal temperature conditions in which each species reproduce, with herbivory increasing with breeding temperature in nature. More interestingly, all three species generally increased herbivory under simulated heat wave scenarios. Results in tadpole’s survival, growth and development support decreased efficiency of carnivorous diets and increased efficiency of herbivorous diets under heat wave conditions. “Our study suggests that the greater herbivory observed at higher temperatures in amphibian larvae may occur in other species and contribute to changes in the structure and function of freshwater environments,” says Germán Orizaola, researcher at the Department of Ecology and Genetics, Uppsala University.